Ready to use floss sugar. Simply pour the floss sugar into the spinner head - no mixing required. Servers approximately 50 guests. 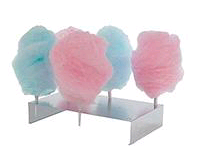 This cone holder will allow you to pre-make Cotton Candy Cones for peak times. Made of rugged and easy to clean stainless steel. Plain white cones are made of durable paper and are tripled-wrapped at the "handle end" to assure you of strength. Sno-Kone Counter Tray, 8 cup, 14"L x 6-1/2"W x 2-1/2"H, brushed aluminum construction. Who doesn't love a Sno-Kone? Cherry Flavored Sno-Kone Syrup is sure to be a hit at any event. This Sno-Kone syrup is ready to use, just add pump. Sweetened with high fructose corn syrup. Who doesn't love a Sno-Kone? Blue Raspberry Flavored Sno-Kone Syrup is sure to be a hit at any event. This Sno-Kone syrup is ready to use. Sweetened with high fructose corn syrup. Sno-Kone syrup pumps are available with one gallon ready-to-use Sno-Kone syrups. Each pump delivers 1 ounce of syrup. Made entirely of plastic and includes stainless steel check valve. Free rental if you purchase Gallon jugs. These sturdy Sno-Kone cups are constructed from extra thick paper and extra-heavy "dry wax" so that the Sno-Kone can be enjoyed completely before the cup collapses! These Sno-Kone cups also have a rolled top rim for maximum integrity and sturdiness. MegaPop "Fun Pop" Popcorn portion-packs are prepackaged with oil, salt and butter. MegaPop brings the "Theater Taste" to your event. Just cut open and empty into your heated kettle and you're the star who is making movie theater style popcorn! Popcorn bags hold 1 oz. of popcorn and provide an ideal container for this delicious treat. This deluxe Dutch funnel cake mix is a one step mix. Just add water and you are ready to make Funnel Cakes. Nacho Grande bag cheese setting the highest standards of quality and convenience. Pumping creates a vacuum that pulls nearly every drop of cheese out of the bag. Simply load the next preheated bag, and you're ready to serve up your next batch of delicious nachos. Capture your customers' attention by giving them a clear view of your product with this crystal clear 8” x 6” x 1 1/2” two compartment nacho tray. Wide side ribbing adds extra strength, It has one large, 19.1 oz. and one 3.3 oz. compartment.